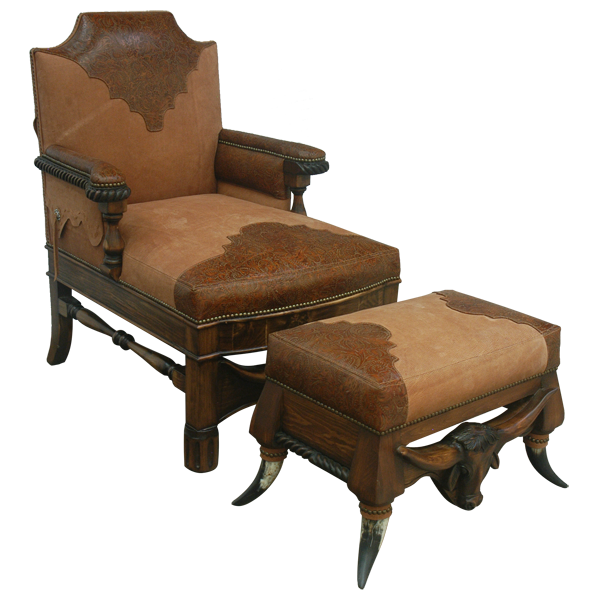 Incorporate into your home your love for the American West and the cowboy way of life with this Western style, handcrafted armchair. 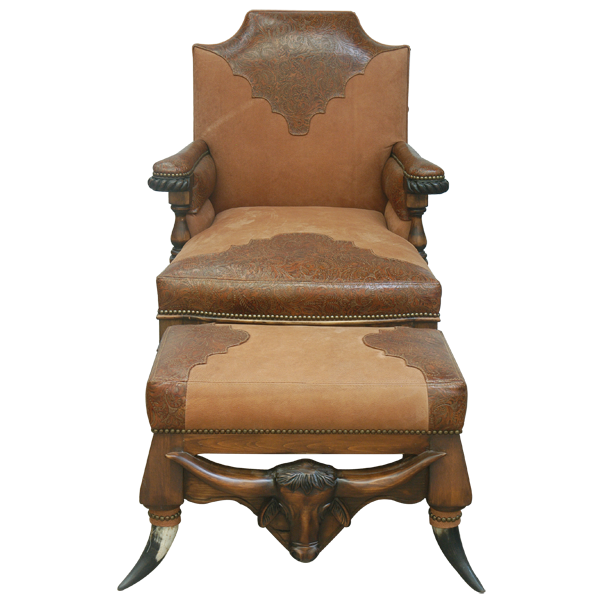 The upper seat cushion and the lower inside seat back of this custom chair are upholstered in real cowhide. The lower seat cushion, the upper inside seat back, and the armrest are upholstered in brown, embossed full grain leather. 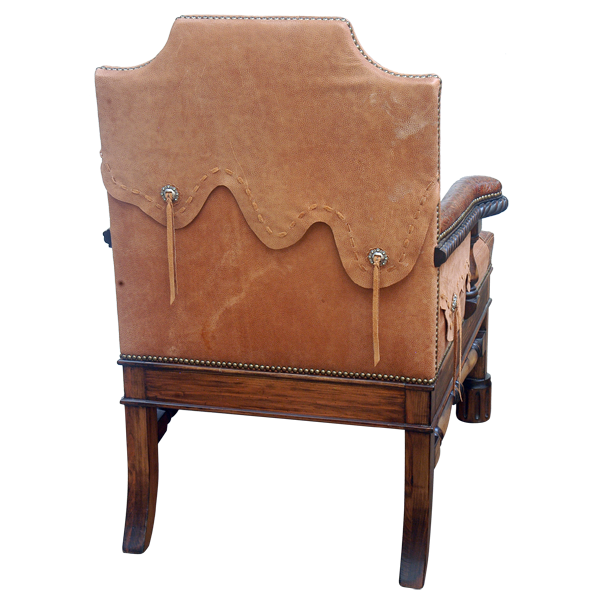 The seat cushion and inside seat back are decorated with a Western cut design The reverse seat back is upholstered in real cowhide with a saddle flap design. The saddle flap design is adorned with two hand forged iron conchos with leather string ties. Each side of the chair also has a hand forged concho with leather string tie. The upholstery is hand tacked with precision to the entire wood frame with decorative nails. 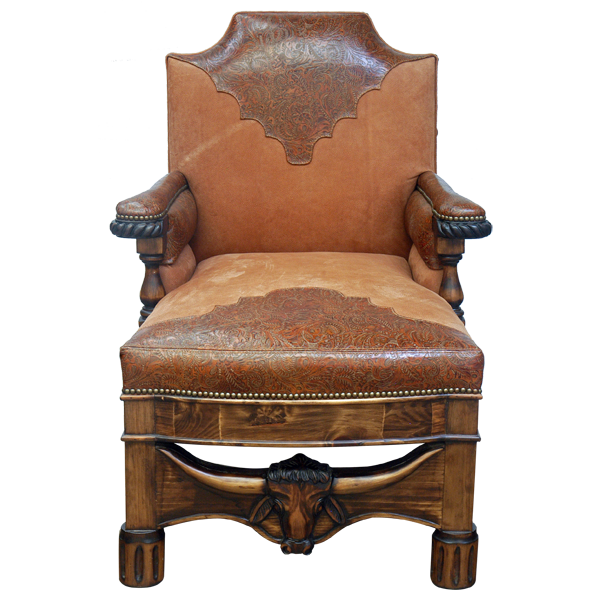 The lower part of the armrest are hand carved with a scalloped rim design, and the lower base of the seat is adorned with hand forged iron conchos. The chair is supported by straight, wood turned, block style front legs, and the back legs are simple and curved. The legs are joined by wood turned crossbars on the sides, and a robust hand carved panel in the front. The front panel is adorned with an exquisitely, hand carved, long horn steer head. The armchair in the photograph is accompanied with a matching ottoman. The chair is 100% customizable.